7 Tips to Make Moving Easier - Learn From Our Mistakes! 7 Tips to Make Moving Easier – Learn From Our Mistakes! Moving is a huge undertaking. Even with careful planning, it was a lot more work than we expected. We did manage to get everything moved and we learned some valuable lessons in the process. Some of the lessons were things we never even considered. I hope these moving tips will help you learn from some of our mistakes. This post is brought to you by 3M and Sams Club. All opinions are 100% my own. How do you avoid common mistakes when you are moving? These are some of my tried and true moving tips. If you follow them, you will have a smooth and easy transition to your new home. One of the best ways to make moving less painful is to organize and plan. Make sure you get a bunch of moving boxes, packing tape, and some kind of padding for breakable items. Newspaper, bubble wrap, and packing peanuts all make good padding. When you think you have enough boxes, get some more. It’s better to have too many than to run out halfway through packing. Where do you find free boxes? Craigslist Has Free Moving Boxes – use the Free section of Craigslist to see if anyone is giving away free moving boxes. You can also post in the Wanted section that you are looking for free moving boxes. Freecycle – join your local online Freecycle group and then post that you are looking for free moving boxes. Nextdoor App- post in your neighborhood to see if anyone has any moving boxes. When you are done, you can post and bless someone else with your moving boxes. Check with local retail stores particularly grocery stores, furniture stores, bookstores, office supply stores, and liquor stores. Our local grocery store put boxes aside for weeks for us, my husband asked the manager and they were happy to help. Pack your boxes “strategically.” Choose a “packing area” ahead of time and box up a few things each day. Mark each box with its contents and destination room. Make sure all your boxes are packed before you go to rent your truck. Load the heaviest items first, in front and on the floor. Pack items firmly and closely. When packing the items in your home, keep things grouped by room. It makes no sense to place items from two different rooms in the same box. This just creates confusion and more work at your new home. Start with the things you don’t need every day and start packing them early. Save the daily necessities for last because you’ll be using them until the day you move. Make sure you clearly label everything and not just on one side of the box. Write what is in each box on all four sides. That way when boxes are piled to the ceiling and you accidentally turned the bottom one the wrong way you’ll still be able to know what’s inside. Consider trying to consume most of the food in your pantry or kitchen as opposed to moving it. Food items are known to spill and can take a long time to pack. In addition, some items are perishable and difficult to move without spoiling them. As you near your moving date, try to meal plan around the food you already have that way you are not moving a lot of food to your new home or having to throw food away. As you are going through your home packing everything, keep an eye out for things you don’t really need or haven’t used in the past few years. Anything that can be discarded, sold, or donated is one less item you have to pack, move, and unpack. If there are areas of your house that are cluttered, why add more clutter to your new house? Think of moving as an opportunity to get rid of the junk, clutter, and useless stuff that’s just laying around the house. 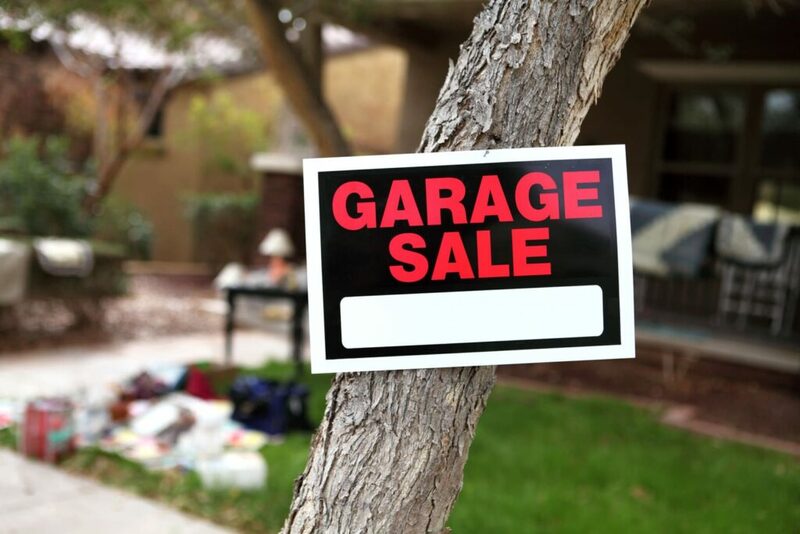 You can read my tips on how to have a successful garage sale. Another mistake we made was to pay for expensive storage for items that we never used when we should have gotten rid of it during the moving process. When you are planning how to move all your items to your new home, consider getting a truck large enough to move everything in as few trips as possible. The best option would be one that will move everything at once. We made the mistake of renting a truck that was way to small and spent so much time driving back and forth. In hindsight, we would have just rented a huge truck and knocked it all out at once. Once everything is at your new home, start unpacking by focusing on the most important areas first. We suggest hitting the bedrooms first. No matter how much you get accomplished the first day, you’ll want a comfortable bed to fall asleep in. The kitchen should be next because you have to eat. You can order food delivery for a few meals until you get everything set up, but it needs to be a priority. After you start unpacking, you can start making it your new home. As I mentioned earlier, there were a few things we never thought to consider until it was an issue. Once it got cold and our heat was necessary, we discovered the air filters hadn’t been changed for a long time and was creating problems. We were all sneezing and sniffling without any other symptoms. A wise friend mentioned changing the air filters to me and I had not even thought about it. When we took the old ones out, it was way past the time they should have been changed. When you move into a new home, it is the perfect time to change the air filters in your heating and cooling system. Now we buy extra air filters and mark on the box with a permanent marker the date of the next time to change them out. It is a simple and inexpensive home maintenance item that often gets overlooked. I love shopping at Sam’s Club! They have amazing deals on everything I need. Right now you can save money on 3M Filtrete air filters. 3M Filtrete filters are $8 off now through November 25th with Sam’s Club Instant Savings. Stock up and save and change out your air filters on a regular basis. Sign up for a Sam’s Club membership to get access to great Instant Savings, like the $8 off Filtrete filters. 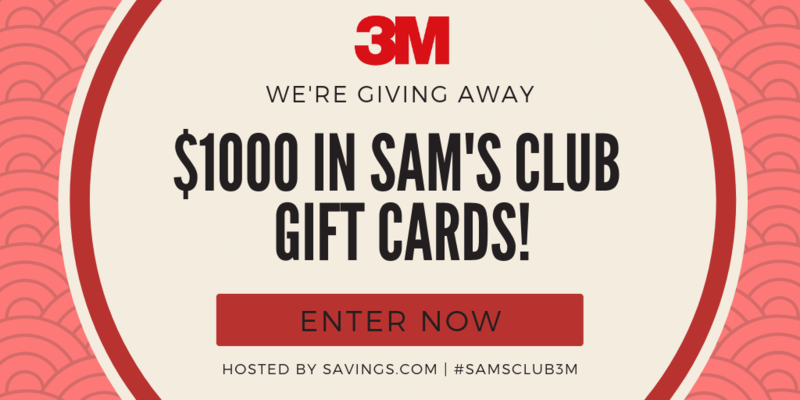 Go to Savings.com and enter to win one of ten $100 Sam’s Club gift cards! This would be such a huge help during the holidays. Good luck and I hope you win!